AG and Sons: Bridal Set Rings? It was the most nervous moment of your life. More nerve-wracking than when you were giving your presentation in front of the whole school in assembly and your knees wobbled with anxiety. You felt more nervous than that time when you asked your crush on a date and your whole body trembled with anticipation. You were nervous till the time you got down on one knee and said those four words. While in that moment although you were confident in asking the big question, your heart thudded heavily against your chest as you are mentally prepared for that right moment and felt your skin tingle with excitement as you awaited the answer you’re hoping for. Now you’ve chosen the special one, you start to consider the wedding ring. Will you be able to find one that matches your chosen ring? But now you have seen a beautiful wedding ring but it doesn’t match the engagement ring. You know you’ve got to get it right as you want it to be perfect, and she will want to be blown away by your choice. Which one ring should you choose? And once chosen how do you get the matching ring? Breathing quickens and you feel sweaty. Panic!! In both situations there is an easy solution. Bridal Set Rings. 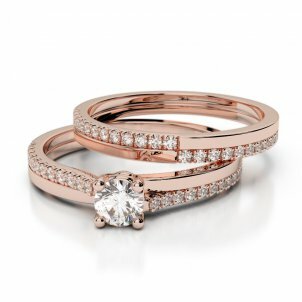 Bridal sets can take all the guesswork and stress out of selecting both an engagement ring and a wedding ring. Put simply, Bridal sets include an engagement ring and wedding ring that have been designed to fit together on the finger. The two rings become one, just like you and your partner will on your wedding day. So why else choose a bridal set ring? 1. The uniformity: A bridal set offers a uniformed look that can’t be matched with two rings that look similar. The rings are designed to look like one piece of jewellery that is preferred more and more by brides today. 2. Cost effective: Buying a bridal set can often work out cheaper than buying two separate rings. Many jewellers offer great deals meaning you can put more money towards your big day. 3. The comfort: Sometimes wearing two different rings can be uncomfortable. One may slip and the other happens to pinch. Bridal sets are designed to slot together thus eliminating any discomfort. You don’t have to buy what you see over the counter. If you still want to design something yourself, then speak with your local and trusted jeweller about creating the set you have in mind. For inspiration or if you just really like the sound of a Bridal Set, then head over to our website and select Bridal Set Rings. There is a vast choice for you to browse and choose from.